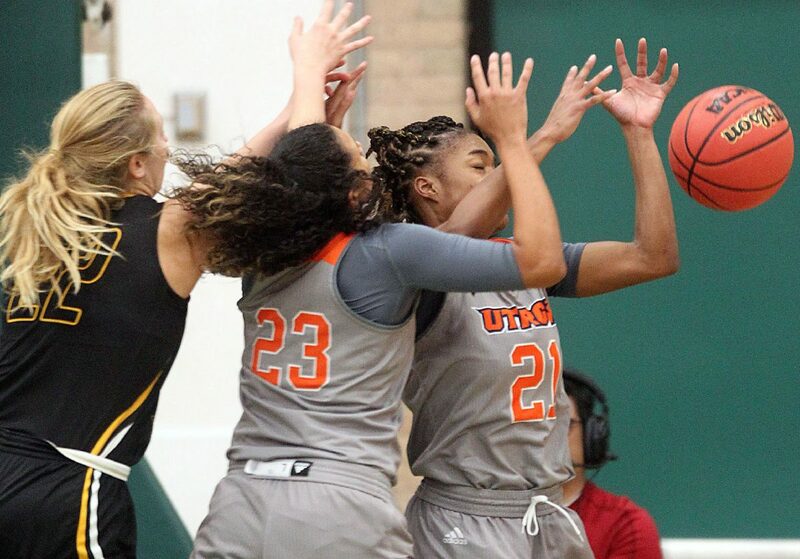 UTRGV Krisynthia Sampson (21) and Makaela Mosely (23) on a loose rebound against Texas Lutheran Abby Hroch (22) during an NCAA college basketball game at the UTRGV Field house on Saturday Nov.10, 2018, in Edinburg. 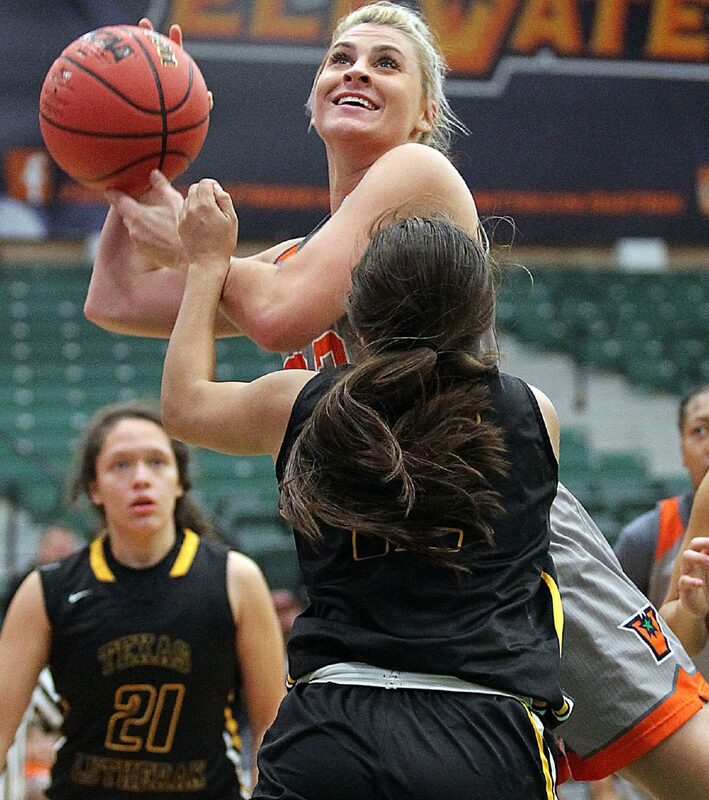 EDINBURG — UTRGV won the tip and three seconds later senior guard Idil Türk was laying in two points for the Vaqueros women’s hoop teams. 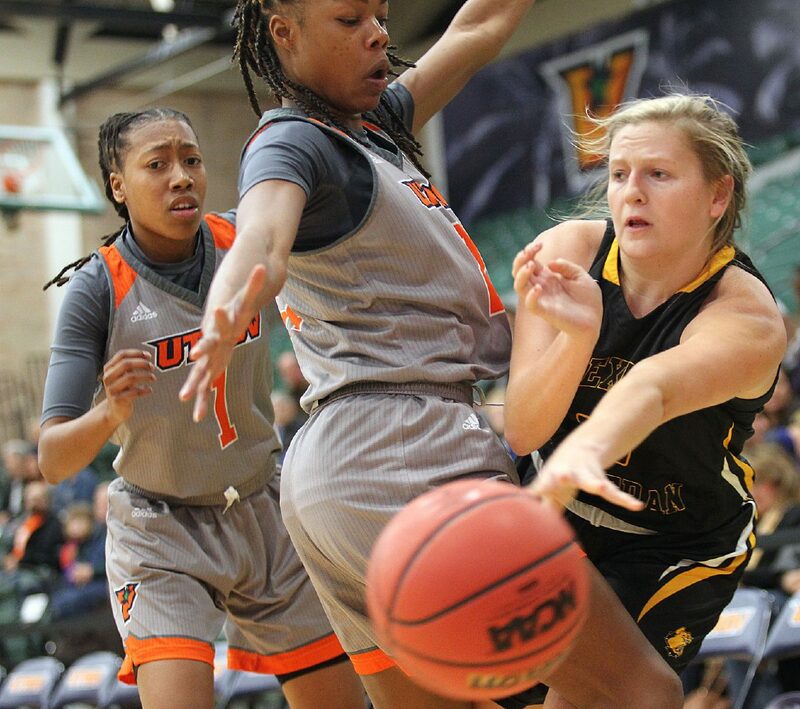 Aggression, speed and high-percentage shots allowed them to cruise to an 82-48 season-opening victory over Division III Texas Lutheran on Saturday night at the UTRGV Fieldhouse in Edinburg. 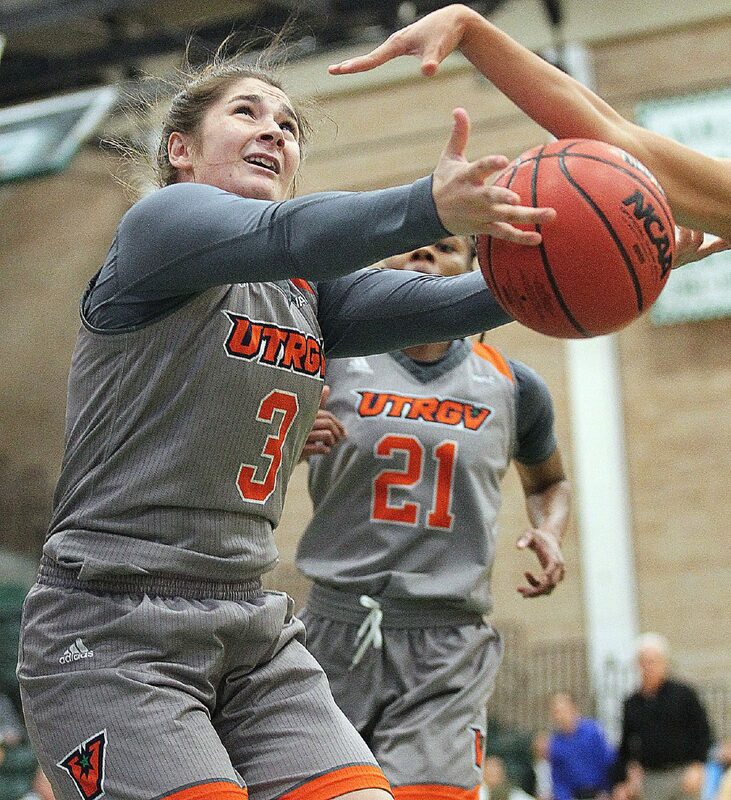 By the time the first quarter was through, Megan Johnson’s buzzer-beater to close out the frame set a program record for points in a quarter, and UTRGV led 31-11. NCAA women’s basketball switched from halves to quarters in the 2015-16 season. The blowout win was the first victory for new head coach Lane Lord. The 44-point margin is the largest win in a coaching debut. UTRGV Daniela Azubell (3) is stripped of the ball by Texas Lutheran Jenesis Navarro (12) during an NCAA college basketball game at the UTRGV Field house on Saturday Nov.10, 2018, in Edinburg. UTRGV Madison Northcutt (32) blocks a shot by against Texas Lutheran Jayla Santa Maria (14) during the first half of an NCAA college basketball game at the UTRGV Field house on Saturday Nov.10, 2018, in Edinburg. 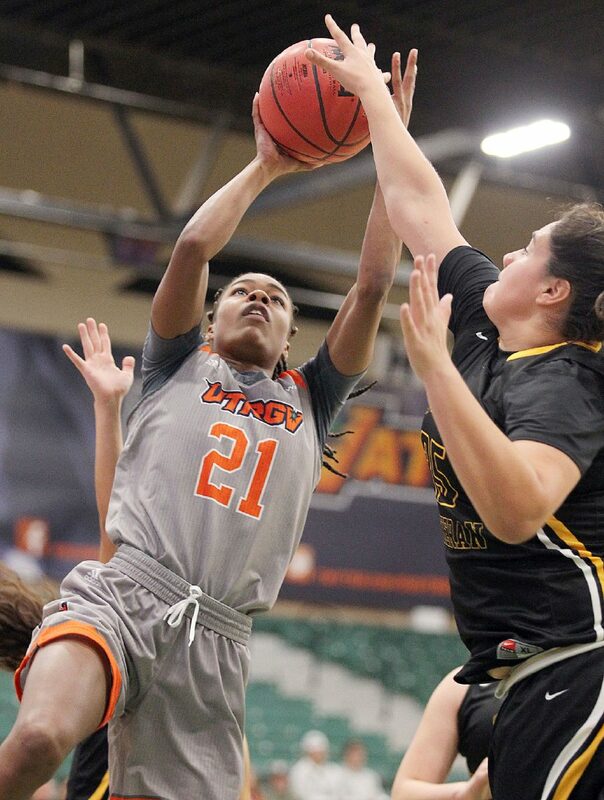 UTRGV Krisynthia Sampson (21) on a drive to the basket against Texas Lutheran Alexia Torres (35) during an NCAA college basketball game at the UTRGV Field house on Saturday Nov.10, 2018, in Edinburg. 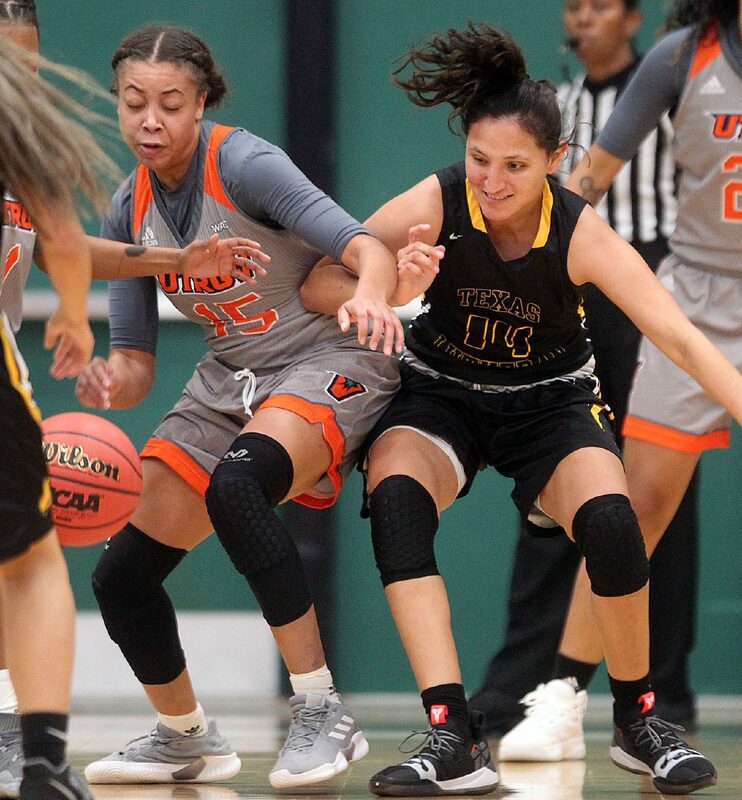 UTRGV Idil Turk(4) battles for a loose ball against Texas Lutheran Jayla Santa Maria (14) during an NCAA college basketball game at the UTRGV Field house on Saturday Nov.10, 2018, in Edinburg. 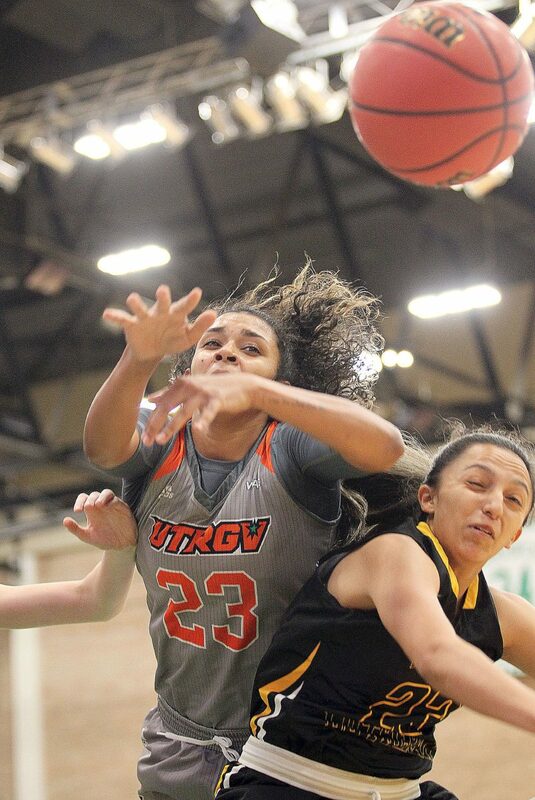 UTRGV Makaela Mosely (23) battles for a rebound against Texas Lutheran Dominique Campos during an NCAA college basketball game at the UTRGV Field house on Saturday Nov.10, 2018, in Edinburg. UTRGV Valeria Tapia (10) and teammate Jameka Dowell (5) apply pressure against Texas Lutheran Dominique Campos(23) during an NCAA college basketball game at the UTRGV Field house on Saturday Nov.10, 2018, in Edinburg. UTRGV Madison Northcutt (32) on a drive to the basket against Texas Lutheran Jenesis Navarro (12) during the first half of an NCAA college basketball game at the UTRGV Field house on Saturday Nov.10, 2018, in Edinburg. 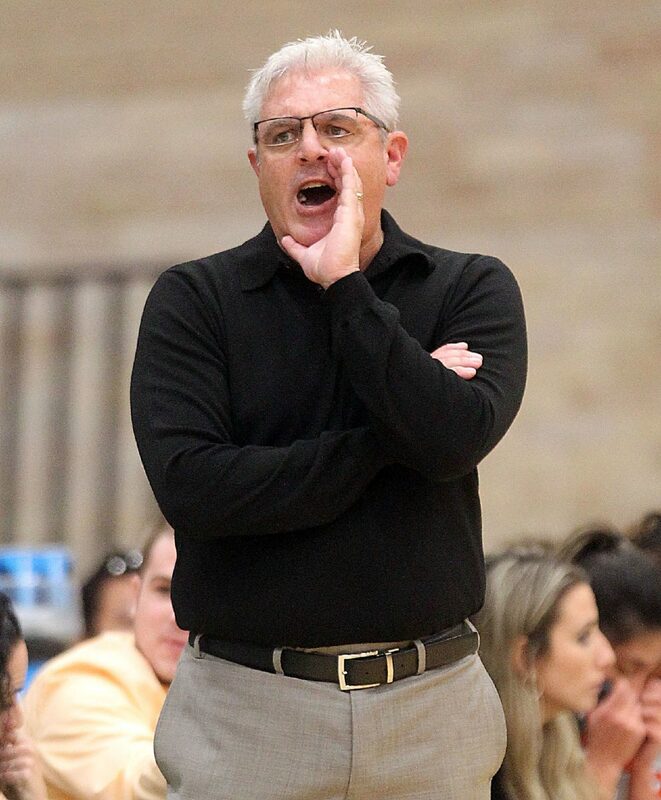 UTRGV coach Lane Ford with instructions to his team during an NCAA college basketball game against Texas Lutheran University at the UTRGV Field house on Saturday Nov.10, 2018, in Edinburg. UTRGV Krisynthia Sampson (21) and Amara Graham (1) double team Texas Lutheran Abby Hroch (22) during an NCAA college basketball game at the UTRGV Field house on Saturday Nov.10, 2018, in Edinburg. UTRGV had 47 points and 10 steals at the half to leave no doubt about the outcome heading into the locker room. Türk had the team lead in steals with four; Graham and Megan Johnson weren’t far behind with three apiece. UTRGV finished with 29 points off turnovers. Two minutes into the game, the Vaqueros had built a 10-3 lead. As the night progressed the trend only continued. Türk had eight of her 11 points in the first half; Graham had 11 of her 15 in the first 20 minutes. Nichele Hyman, whose career in Edinburg has been slowed by injuries, was able to get healthy in time for the start of the season opener. She made her impact felt all night with a career-high four three-pointers and 14 points in 15:36 minutes of action. Madison Northcutt was all over the court in her Division I debut. She is the lone player to follow Lord from his previous position as head coach of Division II Pittsburg State. 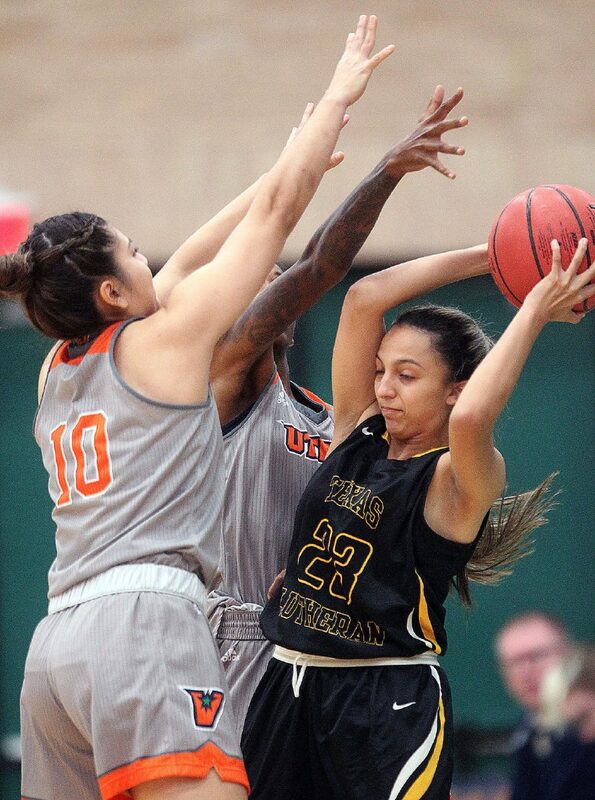 She was hard to miss hustling for boards and forcing jump balls on TLU possessions. The Kansas native had a game-high 11 rebounds (six offensive) to go along with seven points and three blocks. 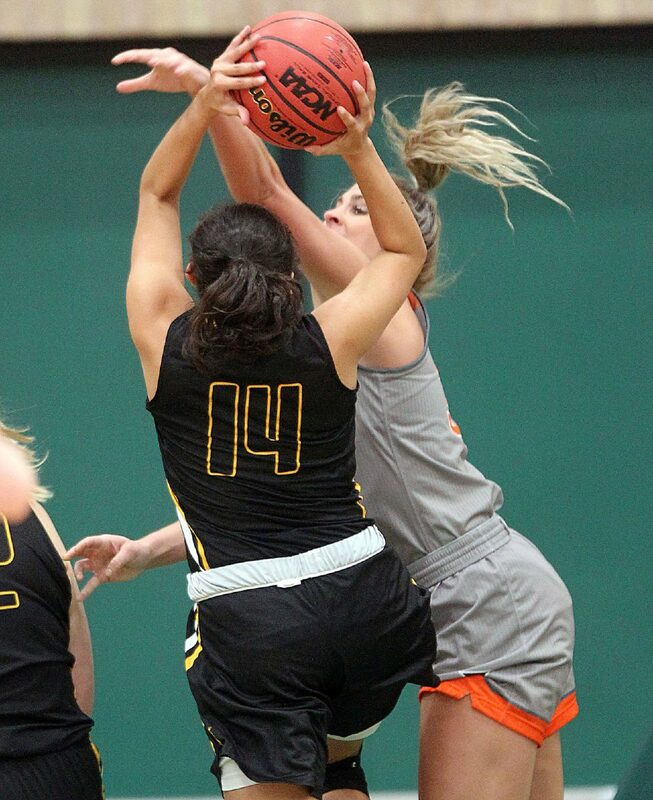 Edinburg native and former Edinburg High standout Jayla Santa Maria was playing her second career collegiate game for visiting TLU. Santa Maria had a fan section that was treated to six points and 2-for-2 shooting from the field. The night still belonged to the Vaqueros who can gain steam heading into a new frontier under Lord. Krisynthia Sampson was the fourth member of the double-digit point club. UTRGV will have a day to recuperate but come right back to the Fieldhouse on Monday evening to host rivals Texas A&M-Corpus Christi.